In the industrialized world leisure travel makes up about 40% of all trips and 40% of all distance travelled: the largest and fastest growing segment of the travel market in these societies. Leisure is a catch-all category in standard travel (diary) surveys: not work, not education, not shopping, not personal business, not bringing or dropping somebody off. It covers going many different activities: from window-shopping to meeting friends for a weekend hike. Some of these leisure activities are regular, such as attendance at church or going to the gym, but others are irregular or unique: that visit to a friend last seen ten years ago, or going on the Hajj. These activities don’t have the same constraints as work or school, to which we are committed through a contract or a legal requirement. Some are spontaneous, but other expressed deeply held commitments, such as a pilgrimage or the gym. While we often think of them as “free”, their social nature makes them binding for us: 80-90% of these activities involve other persons: family, friends, the three other golfers, other players of team, the other 9 worshippers waiting for you to make the quorum in the synagogue; never mind the dog expecting her walk. This overwhelming social nature of leisure implies that the activities are also joint decisions as one has to account for the efforts of the others, when one fixes dates and locations. In some cases the choices have become so habitual, that the organizer does not think anymore, say for club, civic or religious events, but for most others the negotiation is a (large) part of the preparations; which can be seen in the large amount of SMS, email, telephone traffic involved beforehand. As the effort involved in participating face-to-face in an event, meeting, party, get-together involves at minimum the travel to get to its place to spatial distribution of one friends come crucial. 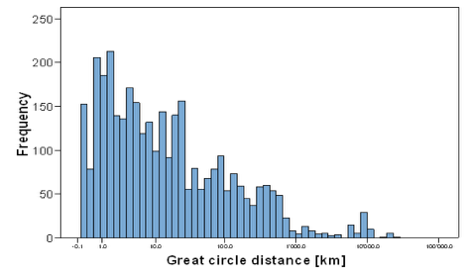 The wider our circles are the more travel, and associated with greenhouse gases will we produce. Yes, the higher the effort, the less likely that we will meet certain persons (See <Point>), but there will be a certain minimum frequency to honor our links: attendance at the wedding of a cousin, being at the funeral of your friend’s wife, the annual joint hike. While sociologists have long studied the (social) structure of social networks, they gave little and generally cursory attention to the spatial distribution of the networks. Recent work by joint teams of transport planners and social scientist has shed light in the distances involved (See figure below). In this typical example from a Swiss study the bulk of social contacts lives within a 30 min car ride, but there is a substantial share living much further away, including some overseas. This distribution should add more long distance contacts as travel and communication becomes cheaper with low-cost flying and zero marginal cost voice-over-IP telephony. So, indeed the home addresses of our friends and our wish to meet them is one driver in greenhouse gas production.